Joyce and Ray Wichelt have broadened their horizons through the business they founded 30 years ago in their home, located north of Stoddard, Wisconsin. That business was Wichelt Imports, Inc. Today the company operates from a 7,200 sq. ft. office and warehouse along Hwy. 35, seven miles north of Stoddard. The business, which has 24 employees, is a wholesale distributor of mostly imported needlecraft products which are sold to retail stores around the world. Wichelt Imports carries premium-quality fabrics for cross-stitching, needlepoint and embroidery. 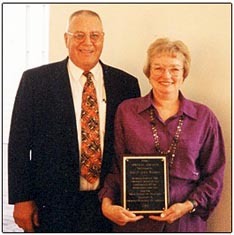 Both owners grew up in Wisconsin; Joyce was raised on a dairy farm near Cashton and Ray grew up in Beloit. Wichelt Imports had its beginnings in 1970 in their home as an importer of German gift items. Joyce was a registered nurse for 11 years until 1974, when she left her job at Lutheran Hospital to spend all of her time at the import business. Ray left The Trane Co. in 1984 after 24 years to devote all of his time to the company. According to Joyce, "As we learned the insides of importing, we expanded our horizons to Norway, searching for wool yarn." Wichelt Imports added embroidery kits to their product line. By 1977, the business had outgrown the Wichelts' home, so Ray and Joyce built a 4,800 sq. ft warehouse, which has since then been expanded twice. But in the fall of that same year, the business had fallen on hard times because a major European kit company dropped the Wichelts as a customer and established its own U.S. business; the Wichelts' two main Norwegian suppliers joined forces with a U.S. competitor to form an American wholesale needlecraft company. Concurrently; the dollar dropped drastically, and interest rates began to rise. However, the business managed to survive, the Wichelts said, thanks to hard work and the support and guidance of their banker and accountant. The late 1970s and early 1980s were rebuilding years for the business. A critical development came in 1977, when Permin of Copenhagen, one of the largest embroidery manufacturers in Europe, asked the Wichelts to be their U.S. distributor, as well as Zweigart of Germany. Most of Wichelt Imports' products come from Denmark and Germany. The company offers more than 700 colors and sizes of fabrics to independent needlecraft shops in the United States and elsewhere. Wichelt Imports carries more than 4,000 needlecraft products, such as even-weave fabrics, which allow finished needleart products to have a smooth appearance. They also supply instruction books and graphs, many types of threads, as well as stitchery accessories such as buttons, ribbons and needlecraft kits. Wichelt was in on the cutting edge of the technological age having set up their own website more than four years ago. They do not sell retail but consumers can access the closest needlecraft shop that carries their products from their website and any visitor who signs their website guestbook is treated to a free graph. There are many "sizes" of even weave fabrics. The number of threads (holes) gives the count ­ 10ct, 14ct, etc. per inch. The more threads per inch, the finer the fabric and the more detailed the stitching that can be accomplished. Because the number of threads is equal in both directions, it is an ideal ground for creating needle ART. Needlepoint is usually done on an even weave canvas with fine wool yarn. Penelope is Wichelt Import's most popular fabric used for needlepoint. Cross-stitch is done on cotton, linen, polyester, silk, and fiber blends such as silk / linen. These fiber blends create different textures and "hand". Some are firmly woven and can be stitched without the use of frames or hoops; others are soft and drape-able. AIDA 6, 8, 11, 14, 16, 18, 20 counts ­ A 100% cotton fabric perfect for all types of cross-stitch. An excellent easy-to-count fabric, yet allows fine details. Jobelan® 16, 20, 25, 28, 32 counts ­ 51% cotton and 49% polyester with an elegant, soft, smooth, shimmering sheen. It is an excellent fabric for pulled work, Hardanger and specialty techniques as well as cross-stitching. Use as sampler, pillows, table linens or any project that is desired. 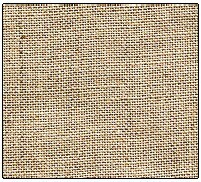 LINEN 16, 18, 26, 28, 30, 32, 35, 40 counts ­ 100% linen woven from a high quality natural flax fiber has a classical elegance. It is the choice of seasoned stitchers everywhere. It has been used for centuries for everything from samplers to wallhangings and embellished clothing. Many pieces of embroidered linen have survived many centuries. Silk thread has long been a perfect complement to this fabric. It is a perfect fabric for samplers, pulled thread, hemstitching, drawn work and cross-stitching. Cross-stitch is often worked over 2 threads on linen. The vast and impressive color range shows the importance of this fabric. Betsy Ross Linen 10, 16 counts - it is an exclusive Wichelt product. 100% linen fibers are woven in a unique fashion to give it an old rustic look. Ideal for "tired eyes" projects as well as bellpulls, pillows and stand up figures. A wide range of colors has been offered, from Revolutionary Red to Antique White. Silk / Linen 28, 32 counts - is another Wichelt exclusive product. 80% linen and 20% silk Provides an elegant "hand" and extremely smooth stitching. An heirloom fabric with rich color. Supports a variety of specialty threads for any type embroidery or drawn thread work. Heatherfield 10, 16, 26 counts - 100% polyacrylic gives the fabric a soft, warm feeling. Minute color flecks are woven throughout creating the "heather" look. A very versatile fabric, it can be used for pillows, afghans, table runners or traditional artwork using many stitching techniques. Country French Linen 28 count ­ 100% linen. Perfect for all counted embroidery techniques, including Hardanger. An elegant linen with a soft hand. A recent addition to the product line. As a needleworker, whatever your interest - cross-stitch, needlepoint or embroidery, Wichelt Imports is a full line distributor ready to service all your needs. Trade inquiries welcomed! This story has been excerpted from a Business of the Week article which appeared in the April 10, 2000 issue of the La Crosse Tribune of La Crosse, Wisconsin. Information provided courtesy of the La Crosse Tribune Publications.